Recipes while on chemotherapy. What to eat while on chemtherapy. While on chemotherapy, patients need for right dose of nutrition is more, as this treatment puts on extra burden on the system in addition to the stress from the surviving cancer cells. Though the needs may vary depending on the type of cancer, age and other illness of each patient, nevertheless the best would be to have energy and nutrient dense wholesome foods and stay steer off fats and sugary foods. 1. Feel Right and Be Energetic. This is most important. You need to think right for your body to work right. Be optimistic to the treatment – only then it helps you heal. Work on your diet with your dietitian. You need to eat small and frequent meals rather than large meals. Concentrate on good carbs from whole grains and protein from curd, eggs, pulses, dals and sprouts. Never miss out the first meal of your day – the breakfast. This is a must to kick start your metabolism and keep you energetic through the day. Focus on healthy grains like oats, quinoa, jowar, bajra, ragi etc. while avoiding breaking your fast with bread and biscuits daily. Try nutritious options like Sprouts Palak Idli, Bajra Roti and Nutritious Jowar and Tomato Chila. Adding veggies to your breakfast would further enhance its nutrition count. They provide vitamins and minerals necessary to build immunity to fight infections. We have added handful of methi leaves to chana dal and made Chana Dal Pancakes and some chopped spinach leaves to create a South Indian delicacy – Jowar Palak Appe. You can create your own combos. Form main meals – lunch and dinner - try and combine a cereal and pulse as we have done in the recipe of Wholesome Khichdi and Bajra and Moong Dal Khichdi. This gives a good quality protein. This is a classic example of wholesome food. Antioxidants are the substances that help in fighting the potentially harmful substances called “free radicals” and cancer cells in our body. They help in enhancing your body’s immunity and prevent or stop cell damage. You are in a stage where you need to focus on this the most. You might have been prescribed multi-vitamin tablets but fresh fruits and vegetables are the best way to pack antioxidants by way of diet. Vitamin A, vitamin C, anthocyanins, lutein, zinc, indoles etc. are some antioxidants to be included in your diet. Few suggestions that we have for you to include fruits in your diet are Fruity Chana Salad, Date and Apple Shake and Blueberry Orange and Yoghurt Smoothie. Veggies are the most easiest to include in the meals… be it a chunky soup like Oats and Vegetable Broth or soup like Nourishing Barley Soup. You can be a more creative and combine both fruits and veggies and make a healthy bowl like Cabbage, Carrot and Lettuce Salad too. Diarrhea is one the side effects of chemo. Many experience it, while some may not. If you face its occurrence, the best things to avoid are sugary foods, fat laden foods, caffeine, all roadside foods, alcohol, milk, uncooked fruits and vegetables, pickles and canned foods and fermented foods as well. Prefer simple home cooked food with just a tinge of spice probably. Try basic soups, watery dals, oats, banana, apple and other fruits without skin. Opt for Healthy Tomato Soup or something simple like Apple Stew. These are soothing for the gut. For nausea, prefer sipping on nourishing drinks (Muskmelon and Mint Juice and Sweet Lime Pomegranate and Apple Juice) or have small portions of dry snacks (Moong Dal Nimki and Quinoa Red Chawli Leaves Khakhra). These help to reduce the feeling of nausea. Avoid strong odour foods along with caffeine and alcohol. Also prefer cool soothing foods than hot foods. Chemotherapy sometimes also cause mouth sores. This is one of the most difficult situation as the aim is to serve tasty food with minimum spices, to heal the sores while providing the key nutrients to nourish your cells as well. Keep sipping. This helps to keep the mouth moist throughout the day. It avoids further dryness. Avoid the canned juices and sugary drinks. Have soothing and cooling drinks like Date Honey Banana Shake and Apple and Oats Milkshake. These energy drinks will fill you and deliver nutrients to keep you going too. It’s a good idea to avoid hot foods including the soups too. This would make the sores more painful. If you wish to have a soup, you can try the Cold Cucumber Soup. You need to drink at least 10 to 12 glasses of water. Always keep a bottle of water with you all the time and keep sipping on it through the day. You can be a little resourceful and buy a Fruit Infused Bottle, to sip on flavoured water like Pink Guava Apple Infused Water if this interests you. Coconut water is also a good way of making up for your nutrient and water needs. Try Sweetlime Infused Coconut Water and Coconut Water with Coconut Meat are some ways to have the pleasing coconut water. You can also discover a treasure of other drinks like Carrot, Tomato and Beetroot Juice, Apple Carrot Drink and Papaya and Green Apple Smoothie etc., in this section. These are truly a tasty experience! 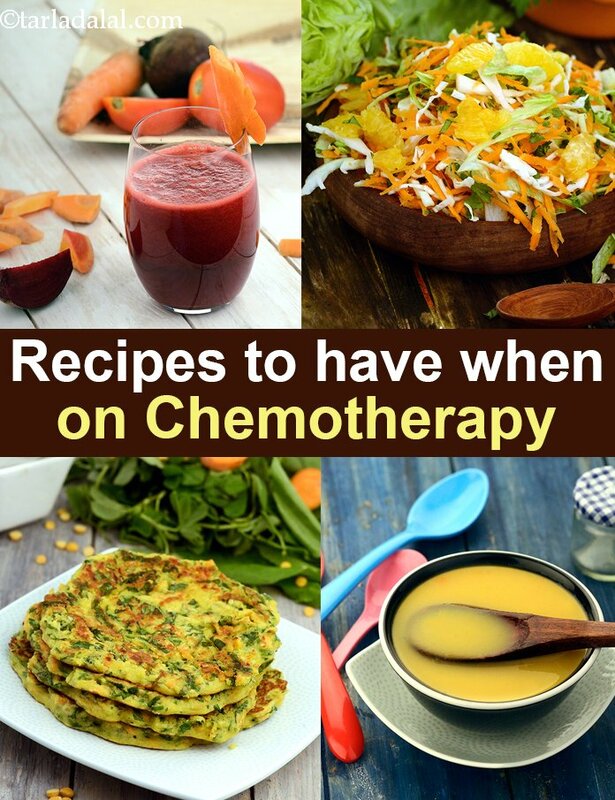 Enjoy our Recipes while on chemotherapy. What to eat while on chemtherapy and other Cancer recipe articles below.